When the first spears of asparagus appear in the garden or in our weekly vegetable box, there is only ever one way to eat them: simply steamed and served with melted butter and sea salt. There is something so beautiful in this simplicity, focussing completely on the heavenly fresh green taste of the fresh, crisp asparagus, it needs nothing else. Could you come up with a meal for at least two people for under £3? That’s the challenge set by the leading food charity The Trussell Trust in partnership with Buyagift with the aim of raising awareness of just how difficult it can be to eat well on a limited budget. I managed to come up with a dish but it wasn’t easy, and I really wouldn’t want to have to work with this budget every mealtime. But for so many people in this country, it is the reality they face each and every day. While the UK might be the seventh richest country in the world, many people here struggle to put food on the table. You can help raise awareness of the work of The Trussell Trust and the urgent need for us as a nation to tackle food poverty by taking part in the challenge and coming up with your own recipe. You can also visit the charity’s website for more ways to support their work, from donating to your local foodbank to raising money for them as you do your online shopping. For my dish I decided to use liver as it is relatively inexpensive. Obviously a vegetarian pasta dish would have been cheaper still, but I wanted to see if I could manage a meat dish on this tight budget. I managed to buy 370g of lamb’s liver from my local butcher for just £1.48 and I only used half of it. A little liver goes a long way. OK, so not everyone likes liver but I’m sure that’s because it’s generally been overcooked when they have tried it. In this dish it is sliced very thinly and fried for only a few minutes, so it is beautifully moist and tender. My husband doesn’t normally eat liver but he enjoyed this. Plus it was cooked in a very generous amount of butter, with lots of chilli, garlic and sage, so absolutely packed full of flavour. It actually tastes quite luxurious despite the cheap ingredients. Cook the tagliatelle in salted, boiling water according to the packet instructions. Beat the egg in a shallow dish, add the liver and coat well, and leave for a few minutes. Heat the oil and butter in a frying pan over a low heat. When the butter has melted, add the chilli, garlic and sage and fry for a couple of minutes. Drain the liver and add to the frying pan. Increase the heat to medium and fry for three to four minutes, turning frequently, until cooked through. Season to taste and remove from the heat. Drain the pasta and add to the frying pan. 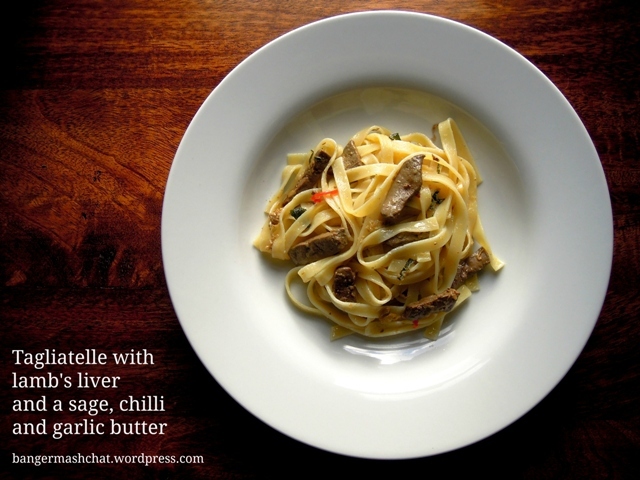 Toss well to coat the pasta in the butter and distribute the pieces of liver. Serve immediately. As well as entering this dish into The £3 Challenge, I’m also sharing it with The Spice Trail (where the theme this month is chilli), Credit Crunch Munch (hosted by Dinner with Crayons, Fab Food for All and Fuss Free Flavours), Cooking with Herbs (hosted by Lavender & Lovage) as it features fresh sage, and Pasta Please (hosted by The Spicy Pear and Tinned Tomatoes) as it contains garlic. In the last year we have dramatically reduced the amount of meat we eat in the Bangers & Mash household. Don’t get me wrong, I could never give up meat entirely. I enjoy it far too much. But there is no getting away from the fact that meat is expensive, both on the pocket and as a global resource. Good quality meat that has been responsibly reared and farmed is not cheap to produce. And I refuse to buy cheap meat because I dread to think what conditions the animals have been kept in. So a major part of reducing the cost of our weekly meals has been to reduce the amount of meat we consume: less of it but good quality stuff when we do. I’m sure this must be much better for us from a health point of view too. At first it was difficult, especially I think for my husband who has taken a little while to convince that you can have a fully satisfying meal without any meaty component. But for me it’s turning into quite an adventure, discovering a whole new world of vegetarian cuisine. This pasta dish, pappardelle with courgette (zucchini) and basil, is one we eat quite often, particularly in the summer when courgettes are in abundance. I have actually been making it for years – it has been my staple dish whenever veggie friends came over for a meal. Now we eat it with or without the vegetarian guests. It’s based on a Jamie Oliver recipe. 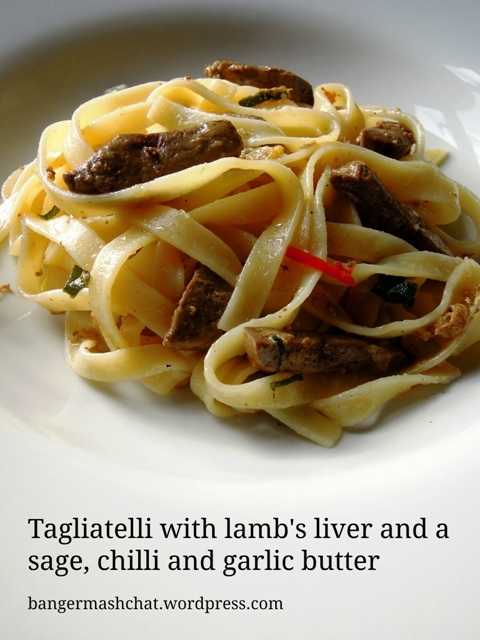 He makes it with tagliatelle but I tend to use whatever pasta happens to be in the cupboard. Pappardelle is my favourite for this. Oh yes, and I use much more garlic than Jamie. Bring a large pan of salted water to the boil and cook the pasta according to the packet instructions. Gently fry the garlic in 4 tbsp of olive oil for a minute, then add the sliced courgette and cook for 2-3 minutes. Add the lemon juice and basil and cook for a few more minutes until the courgette is tender. When the pasta is ready, drain and combine with the courgette. Season to taste, add most of the parmesan and remaining olive oil and mix well. Serve with some more torn basil and a sprinkling of parmesan.